Pull-on style with covered elastic waistband. Two patch pockets and one cell phone pocket. Reinforced seams at stride and inside leg for strength. 65% Polyester/ 35% Cotton Traditional rise. Relaxed hip and thigh. Straight leg. Regular inseam: 31 1/2" Petite: 29", Tall: 33 1/2"
Affordable, flattering, and cute! 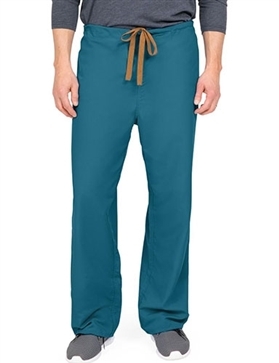 These pants feature a combination elastic back and drawstring front. Side pockets. 65% Polyester/ 35% Cotton. Mid rise. Relaxed hip and thigh. Flare leg. Regular Inseam: 31", Petite: 28.5", Tall length: 33". Men want comfortable workwear too! So we gave you this non-roll 1 1/2" elastic waistband pant with a braided drawcord and a zipper fly front. Don't miss the button closure back pocket and two pockets with coin divisions. 65% Polyester/35% Combed Cotton Regular: S-5X. 31" inseam.